The Bangla Hope family has grown by four children in the last month! First of all, let me tell you about baby Lorence. A few years back, baby Lorence’s Mother, Sabina worked as a care giver for the Bangla Hope Orphanage. She left to get married and start a family. She married a young man who works as a Truck helper day and night. He travels far away from home most of the time. When Sabina became pregnant, she felt that it would be nice to go to her Parents home during her baby’s delivery. But home deliveries are so risky. Her parents live in a remote area and it wasn’t good at all! 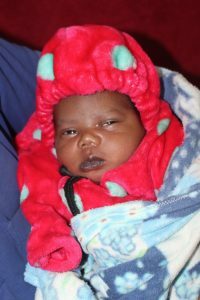 On November 25, 2018 Sabina delivered at home but there was too much bleeding. Later on that day she was taken to the Dinajpur Hospital and by that time Mother (Sabina) passed away. It was a shock for the everybody. The very same day that baby Lorence was born, his mother, Sabina died. Lorence has now joined the Bangla Hope family. Now let me tell you about two sweet sisters, Mow and Mitu. 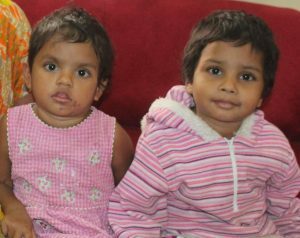 Mow and Mitu are still hoping that their father will come home soon after his treatment of hand infections. While their father was leaving, he told them that he will bring some apples and Chocolates back from the city. But it did not come true. Tragically their father passed away. Their Mother and Grandparents are so sad. Their Father was the only person who made income for the family as a day laborer. Now they don’t have any hope. It was a great time for the family during the Sabbath day – the children went to Church with their family, but now they miss their Dad and are so sad. Mother doesn’t know what to do with these two kids because they don’t have enough food. Neighbors helped to give food for few days only, but the family needs more of that. They began searching for a placement for the little two kids because Mother must go to work and support herself and could not care for the children. They heard about Bangla Hope Orphanage and applied for the children to become part of the Bangla Hope family. At present Mow and Mitu are playing together at Bangla Hope orphanage and making new friends in the Children’s Home & adjusting to the environment. And lastly, I introduce you to Suporna. Suporna has had a remarkable journey. Here is her story: Suporna was born close to Kalkata, India. Kolpona, the mother of this baby, went there without any passport and visa. She married a Hindu man who drank too much and worked as a Truck Driver. Later, the man demanded a dowry from her parents but Kolpona doesn’t have parents. For this reason, the drunk man beat her and kicked her almost every night. It was so terrible for the family. One day the husband was found dead on the road side from drinking too much alcohol. But now, Kolpona and her daughter had worse problems, especially no food to eat at home. Mother took the courage to return to Bangladesh to her relative in the hopes she could get shelter and food. She said that her journey was a terrible experience for them while crossing the Indian / Bangladesh boarder; she thought that she and her baby might die or be shot by the Indian Army. But during the night they entered into Bangladesh through the ponds and canals. After coming to Bangladesh she found one of her sisters but she couldn’t help her. 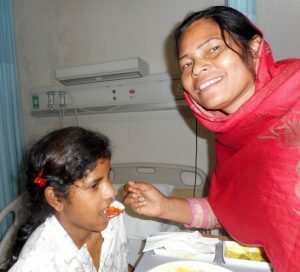 Kolpona learnd about Bangla Hope and wanted her daughter Suporna to join the Bangla Hope family. Now Kolpona can support herself through some work, while knowing that her daughter Suporna is being loved, fed, and cared for. At present Suporna is playing with the other kids at Bangla Hope, making new friends in the Children’s Home & adjusting to the environment. All four of the children are in need of sponsorship. Please know that when you sponsor a child at Bangla Hope, you are making a wonderful difference in their lives. 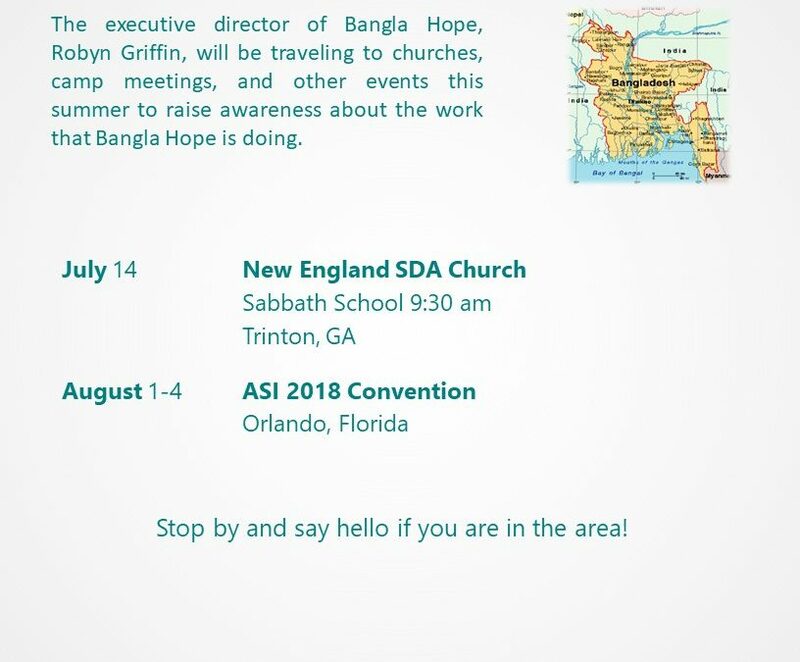 It is our desire that the children at the Bangla Hope Children’s Home not only have monetary support from their sponsors, but that the sponsors are willing to build meaningful relationships with the children through letters, photos, and possibly gifts on special occasions. Some sponsors are even able to make it over to visit their child/children. If you would like to start sponsoring one of our new children, please get in touch with us! Life is very much like rafting a river. You kick back and enjoy the peaceful moments as you float the tranquil waters that run deep…not knowing that you are just moments away from class 5 rapids. It happens in an instant, and then, all that you can see is white water. October 10, 2018 was just another day for Tarini Soren, cashier for Bangla Hope. Suchitra, his wife, has been the Administrator of Bangla Hope since 2005. However, on the 11th of October Tarini began to complain the he wasn’t feeling well. He began to experience dizziness and felt pain in his left arm. Suchitra checked his blood pressure and became extremely concerned that there was something seriously wrong. On October 16 they visited a physician who informed them that Tarini had had a heart attack sometime recently and that he needed further evaluation as soon as possible. On October 18, the report came that he had serious blockage and needed to see a specialist soon. Sabbath evening after sunset the Sorens boarded a bus bound for Dhaka where Tarini had scheduled an appointment with a Christian doctor at Square Hospital for the 21st. After an examination Tarini was immediately admitted to the hospital where an angiogram revealed serious blockages in three main vessels. The only option was open-heart surgery. The doctor wanted to operate immediately, but Tarini decided that he needed time to consider how best to proceed. 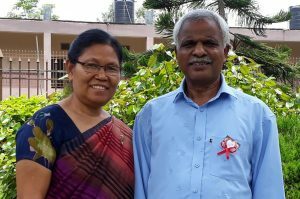 After several days of prayer and discussion with his family, he finally consented to the bypass surgery which took place on October 30. 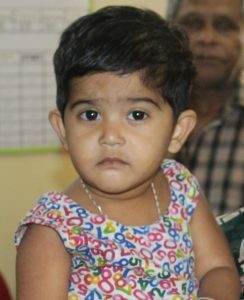 Surgery began at 8:30 am and Suchitra did not receive a report regarding the outcome of the surgery until 4pm that day. The news was good, however. Tarini had had a successful quadruple bypass and was doing as well as could be expected. Tarini was immediately moved to ICU with the expectation of remaining there five days. However, it would be nine grueling days before Tarini was moved into a regular hospital room. Sleeping was practically out of the question and food was unappealing. 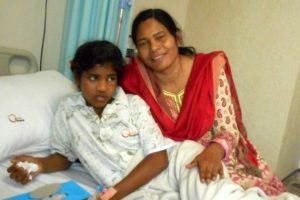 The days seemed to stand still for Tarini and he almost wished that he had never had the surgery. On November 8, he was finally transferred from ICU and on the evening of the 10th released from the hospital. It was assumed that he would have to remain in Dhaka until somewhere around Christmas but at his follow up appointment on the 17th the doctor insisted that home would be a better place to mend. The Sorens wasted no time obtaining a van to bring them back home on November 19. Children and staff ran from all over the campus to greet the Sorens as they drove in the gate. We immediately gathered in a circle of prayer thanking God for all of the prayers that He had answered on Mr. Soren’s behalf. We thank you for your prayers and concern for the Sorens. It has been a rough patch for them! If you wish to help in meeting the financial expenses for his surgery, it would be much appreciated. The total cost was $5,000. Thank you for your love and support for our Bangla Hope family! 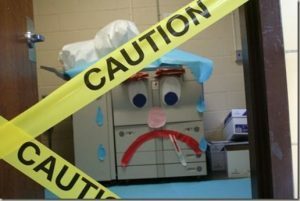 This is not a photo of our actual copy machine, but we thought that it accurately illustrated its poor state of health. Thanks to our amazing supporters, all of the money has been raised to purchase the new copier. It’s so helpful to be able to count on friends who respond to the work we do. Each year Bangla Hope continues to advance its mission of feeding, educating and bringing Jesus to these children. Thank you again for your generosity! Occasionally emergency needs arise in which we need an immediate answer. This is one of those times. Our copy machine in the administrative office in Bangladesh is quickly dying. It is the only copy machine we have for major needs. It is used for office, school materials, and copying Bible coloring pictures for our weekly branch Sabbath Schools, as well as an endless array of other tasks. It has been in intensive care for at least the last year, but it is getting weary. Asking a VW to do the work of a ¾ ton pickup truck leaves a lasting mark. So…we need to invest in a “3/4 ton pickup truck” model copy machine…a model that is designed for heavy usage. One like that will cost around $4000. If the Holy Spirit speaks to your heart would you consider helping us in this hour of emergency? Thank you for making a difference in the lives of our children and the people of Bangladesh.